From the glazed terra cotta tile detail on the front cover (National Radiator Bldg), to the entrance lobby of the Daily Express building on the back cover, you’re in for a thoroughly enjoyable trip through the highlights of Art Deco in London. 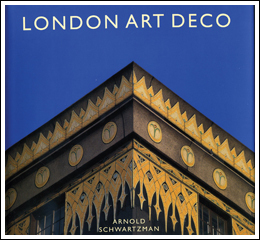 London-born Arnold Schwartzman is our guide, and he shares his personal favorites, showing entire buildings or the finest decorative details, including theatres, hotels, cinemas, civic, corporate and residential buildings. Luckily for us, many buildings from the 1920s and 30s still survive. We’re happy that they’ve been cleaned up so that we can enjoy them. 156 pages, HC, 9” X 8-1/2”, 175 color photos.